Southport Presbyterian Church was organized May 20, 1898, by the Wilmington Presbytery with W.M. Shaw, the evangelist for the Brunswick Field, serving as pastor. Seven charter members of the congregation included Mrs. L.J. Pepper, Mrs. A.M. Vernon, and Price Furpless, who was elected Ruling Elder, an office he held until 1957. Worship services were held in members’ homes, usually Mrs. Pepper’s at 304 W. Moore Street, until the first sanctuary was completed in 1903 on Caswell Ave. between Nash and W. West Streets. 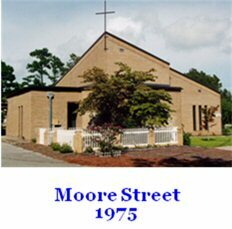 In 1958 the church moved to its current location at the corner of Stuart and Moore Streets. In 1955 James and Margaret Harper had donated this property and it has been the site of 3 sanctuaries. The first is currently serving as the Education and Administration Building. The second was built in 1975 and was used until our present sanctuary was completed and dedicated in 2006. Throughout the years Southport Presbyterian has been blessed by having the leadership, dedication, and enthusiasm of more than 40 ministers. The early ministers were usually evangelist for the Brunswick County area. They used Southport as their headquarters and the manse was here. 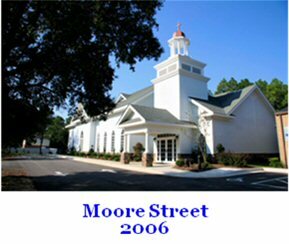 Some of the other churches served at various times included Phoenix in Bethberei which dissolved in 1929, Sweet Home in Shallotte which dissolved in 1942, the chapel at Orton Plantation, Bolton, camp pastor at Fort Caswell, and Oak Island summer beach services. Southport and New Hope in Winnabow were served by the same minister until 1976. In that year the Reverend Frank Elliott became Southport Presbyterian’s first full-time minister and since then the congregation has been served by a full-time minister. At first worship services were usually held Sunday evening, with morning services added during some periods, and Wednesday evening. During one period the minister would preach at Southport 2 Sundays and New Hope 2 Sundays each month. Then for some years the minister would preside at a 9:30 service at either Southport or New Hope and an 11:00 service at the other. For the first 10 years Price Furpless served as the only Ruling Elder. In 1908 Thomas (Thompson) Williams joined him and later others were also elected. In 1912 the congregation decided also to elect Deacons. The congregation was served by both until 1974 when the congregation voted to establish a unicameral form of government with the office of Deacon eliminated and the Elders assuming those duties. As part of this change, 6 Elders were elected with rotating terms. The first election voted in 2 Elders each for 1, 2, or 3 year terms, with the option of being elected to a second term. In 1978 the Session was increased to 9 Elders, each serving a 3-year term with the option of being elected to a second term. In 2006 the Session voted to limit Sitting Elders to a single 3 year term, with at least a year off before serving again. It wasn’t until the 1960’s that women were allowed to be ordained as ministers, Elders, or Deacons in the Presbyterian Church. In 1966 the first two female Deacons were elected at Southport Presbyterian and in 1972 the first 3 female Elders were elected. In 2003 the Reverend Mary Alice Haynie became the first female minister, followed by the Reverend Martha Jane Raedels, and our current minister the Reverend Dr. Ann B. Jahnes. The leadership and members of Southport Presbyterian have always been involved with the welfare of children. Christian education, youth activities, and outreach programs have all been important. From the beginning Sunday School has been active with many children, youth, and adults participating. In 1898 there were 20 students and 4 teachers in the Sabbath School. In 1930 with 57 members there were 2 Sabbath Schools with 200 people involved. 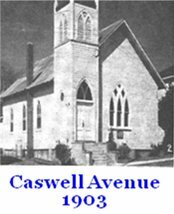 In 1950 the house next door to the Caswell Avenue sanctuary was bought and used as a center for Sunday School classes, church meetings and dinners, youth activities, and meetings by other groups. In that same year the members organized and sponsored the first Girl Scout troop in Brunswick County with 28 girls participating. In 1954 the members began sponsoring a Cub Scout den and later a Boy Scout troop. Weekly social activities for all youth were a big draw for the youth in Southport. From 1970 – 72 Southport Presbyterian was the location for Fort Johnston Academy, a private school for children in grades 1 – 8. The leaders and members of Southport Presbyterian have long been dedicated and actively involved with our local and world-wide community using their time, talents, enthusiasm, and financial resources to help others. In the early years revival meetings were held periodically. In the 1930’s and later missionaries serving in various parts of the world would come to Southport Presbyterian and speak of their activities and challenges. In 1916 a ministerial association, forerunner to the Interchurch Fellowship, was formed with Southport Presbyterian’s minister, W.M. Shaw, serving as chairman. In 1979 Southport Presbyterian organized the first CROP Walk in the area with walkers meeting in Boiling Spring Lakes and soon this became an ecumenical project. By 1976 church members were participating in and leading worship services at Ocean Trail and also later Dosher, and later started weekly Bingo games at both. The women of the church first organized in 1919 as the Ladies Home Society with 14 members which grew to 51 the next year. In 1922 the group started the Birthday Offering which has been continuous ever since. Sometime before 1947 the name changed to the Women’s Auxiliary, then WOC (Women of the Church) in 1948, and in 1986 PW (Presbyterian Women). Whatever the name, they have always been an active part of church life and provided support for local state, nation, and world-wide causes doing everything from rolling bandages to financial donations. Starting by 1923 Men’s groups have also been a vital part of the church and community. 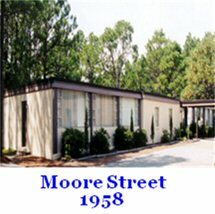 In 1997 they helped to renovate and support Dosher House (Providence Home) as a safe haven for teens. In 1988 a Memorial Garden on the church grounds was dedicated. In 1990 it was noted that the garden was “beautifully landscaped and maintained with flowers, a cement bench, and low shade trees. The wooden markers are used for identification and a plaque has the names on it” In 2007 the garden was rededicated with expansion, renovation, and the addition of a water feature. In 1998 a time capsule to be opened in 2098 was created in conjunction with the 100th anniversary celebration of the church. 21 items representing the church’s 100 years were included. The following year the capsule was buried in the Memorial Garden. Upon completion of our present sanctuary the time capsule was moved and reburied near the cornerstone of the church. Throughout its history the church has been blessed with gifted, faithful, enthusiastic members, lay and pastoral leadership, and friends of the church who with God’s help have strengthened the church’s witness and deepened its commitment to Christian discipleship.